CC and I are arguing about whether we are on a sand spit or on a peninsula. We could both be right. 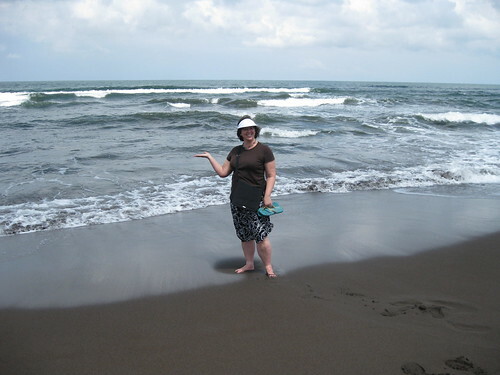 What is absolutely certain is that we are further from civilization than I have ever been – a couple hours on paved roads from San Jose, then another hour plus on unpaved roads, then 45 minutes up a muddy waterway to the riverfront village of Tortuguero. I mean, it’s not exactly the heart of darkness, given that there are both Canadian retirees and goat cheese pizza here, but on the other hand, you can walk the beach 22 miles and not run into anything the whole way. As in, nothing. This is a sweet sign, no? 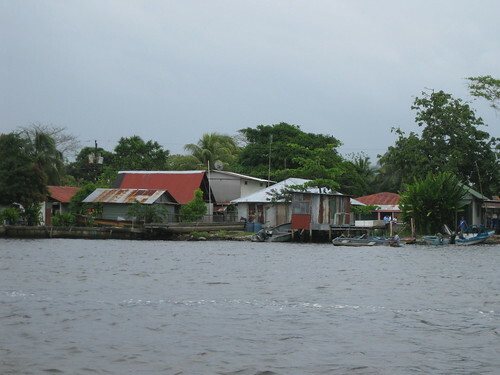 And behind it, Tortuguero’s one and only street. No cars at all. There were usually just some street dogs and cute kids riding bikes. 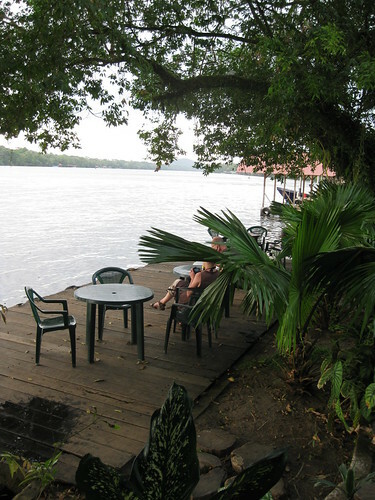 The little river village of Tortuguero is would be where I would come to write my novel. 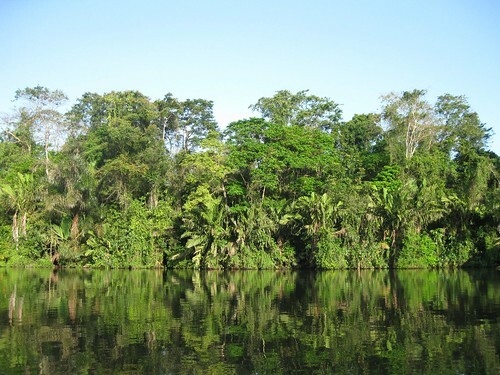 It is about half a mile long and on about 200 yards of dirt wedged between a river and the Caribbean. The people are a gorgeous mix of Black and Latino, Costa Rican and Nicaraguan. I would sit out on the dock at Casa Marbella and write and write like Hemingway. Except better. (Snort). I would drink semi-frozen ginger ale in the wet heat and listen to the howler monkeys and write the hell out of that thing. I would. When we had to go back to civilization, we caught a ride with Jungle Tom. We had heard tales of Jungle Tom from some Dutch guys we met the night before when we were drinking bad white wine and playing Crazy 8s on the dock with Roberto, who ran the hotel. Tom’s boat arrived first, at our dock, where his skinny, silent driver picked us up. 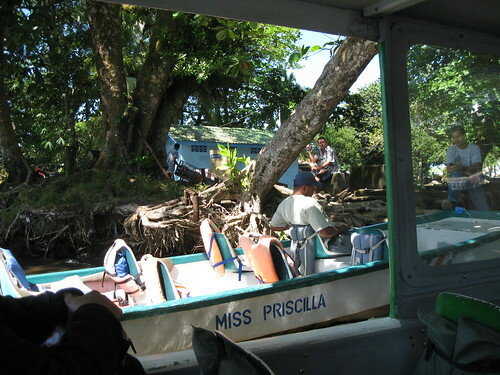 The boat driver took us over to the public dock, never saying a word. We waited and waited, until a large, sweaty man, who looked for all the world to be the victim of a very bad hangover (i’m not saying he was hungover. But he really LOOKED hungover), showed up and climbed aboard. The public dock, where people just hang out in the shade. We began speeding up the 32 km of canal, flying along the glassy water in our flat little tourist boat. Jungle Tom made a pile of life vests, put his head down on them, and fell fast asleep. He awoke only to harangue some German ladies about switching seats on the boat and throwing off the boat’s balance, and later to bolt awake to point out exotic animals inhabiting the river banks, like the Jesus Christ (because it walks on water) lizard. 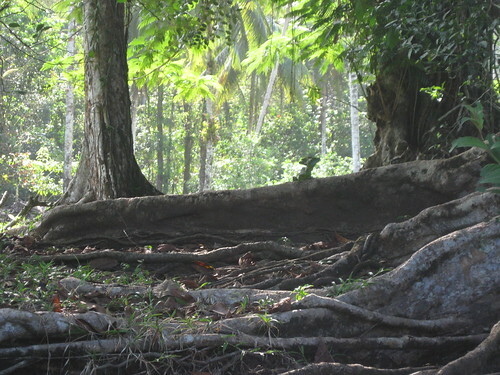 The little lizard is that bump standing on the hindmost tree root. How Jungle Tom spotted these things from the middle of the river is beyond me. Once Tom spotted some animal, he would gruffly demand – not ask for, demand – people’s cameras to take photos. People were starting to get a little freaked out by Jungle Tom’s behavior. After about an hour speeding up the river, we came to a landing. We got off the boat and in to a Mercedes 14-passenger van. 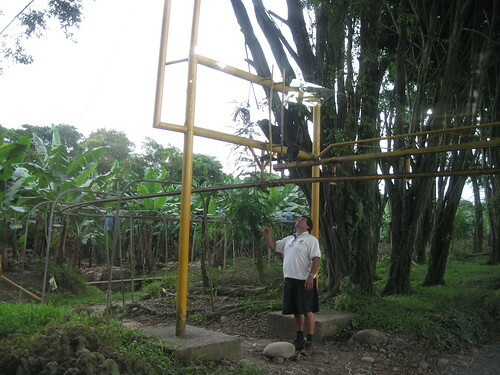 We had been told that we were returning to to San Jose, with a stop for a prepaid dinner along the way. We drove for about 90 minutes on unpaved road through the banana plantations, the stones in the road sometimes as big as basketballs. The van made this weird bubbling sound from the suspension or maybe the brakes, and we had Bob Marley blasting on the stereo. We lurched and bounced along slowly over the rocky road. When we finally got to the paved road, everyone cheered. My heart seized up a little. San Jose was one direction. 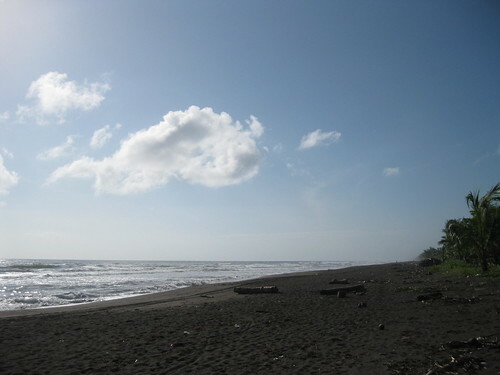 Cahuita was in another, about an hour down the road or more. “San Jose,” the man replied. Great. It seemed like he had no idea where he was supposed to be taking us. At this point, I realized that the chances of us stopping for the prepaid dinner were slim. I gave thanks for the fact that I had wisely stashed some Clif Bars in my bag. (Word to the wise: Clif Bars are a traveler’s best friend and have saved me many times). We caught traffic and crawled along for hours. It would not have been so bad except that Tom continuously honked at the traffic in front of us and tried to pass anywhere he could, stupidly, impotently, dangerously, gaining a few feet of ground at the cost of many grey hairs among the ten of us left on the bus. “Oui, oui,” was the only thing I could think to say. I began praying then. I had been annoyed and amused before, but now I was afraid of this madman. The darkness fell and the rain began to hammer down and we were in the mountains and I don’t know how it was because I had my eyes closed and was breathing four counts in, hold four, four out, hold four…trying to keep a grip on my sanity. The man told us his wife was sick, they couldn’t get a cell signal because of the mountains, the car was broken down. Tom invited them to ride with us. He didn’t even know what the woman was sick with, and he invited them to ride with us. Could have been anything – something highly contagious – who knows. Thank God the man said no, all he wanted was for us to report the breakdown at the police station on the top of the mountain, past the tunnel. So he was not, in fact, a bandit. Whew. It was about 6 hours total on the boat and in the van. Finally the rain stopped and we saw the lights of San Jose in front of us, and all of us, French, American, Argentinian, every one, clapped and cheered just to be alive. As we saw the city grow closer, the Eagles came on the radio. I don’t even like the Eagles, but CC and I didn’t care. We didn’t care if people thought we were insane American middle-aged ladies. Wow, beautiful. Here in Jordan, we have sand. Lots and lots of sand. An ocean would be nice right about now. It was gorgeous. And so different from anywhere I have ever been. Ha! I was a Peace Corps volunteer in Costa Rica a thousand years ago, and it’s wonderful to hear that it hasn’t changed a bit. I think it is probably a LOT more touristy, which is good in a way, because it makes everyone so keen on preserving the natural beauty that people come to see. Dollars are accepted pretty much everywhere, and dispensed at many ATMs. 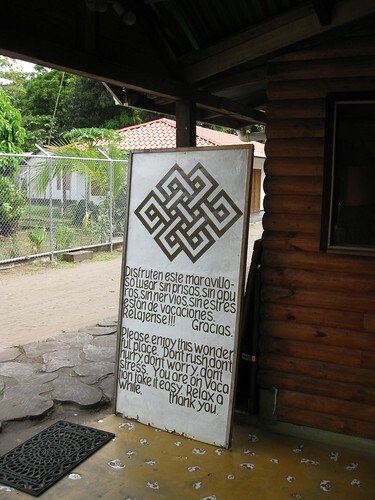 I’m not religious in the least, but the roads in Costa Rica had me praying intensely when I was there in 2005. They’re quite literally terrifying! It was the passing the gas truck on a 2-lane road in the dark and rain in traffic that got to me. Did I mention we were towing a trailer? Is Jungle Tom wearing a skirt? LOL no, just giant shorts. I hope. Yours was a great story, and kind of highlights the Costa Rica of today – rustic and secluded Caribbean, mixed with San Jose traffic, and a measure of the Pura Vida philosophy stirred in. This is a country coming into its own and sometimes there are rough edges – it’s a trade off with today’s escalation to modern infrastructure, almost being a tug of war. I do prefer the natural elements though, although some may be disconcerting and uncomforting, for all the benefits that Costa Rica offers. I was picturing Jungle Tom to be more like Kurtz and less like … a guy wearing culottes. Wow! That was an adventure. I love how you told this. Meeting the Caribbean for the first time is special. I love it. CC got verklempt at the Caribbean. Oh my gosh, what an adventure. You are so much braver than me. It looks so beautiful, but I just don’t know that I could do it. Am such a wuss. Brave, or stupid? I’m not sure.